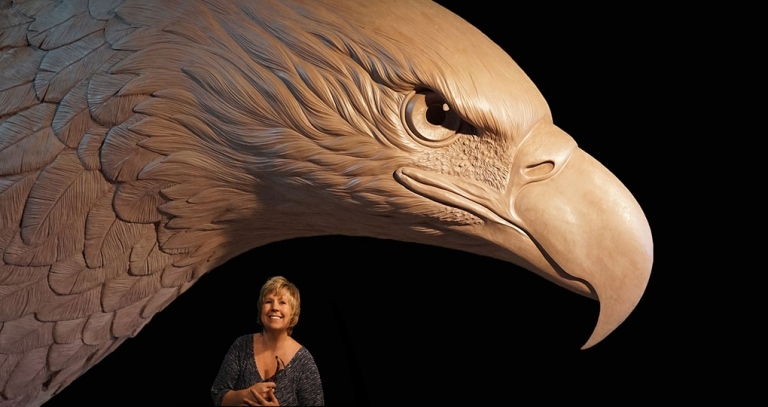 Without sculpting assistants or scanning technology, Heather Soderberg-Greene is creating a bronze eagle sculpture with a 55-foot wingspan entirely by hand. It will soon be the largest sculpture of its kind in the country, and possibly the world. Heather spent two years working for a company that other artists hire to create their “sculpture”, Heather would perfect the statues after the robot CNC machine carved them out of hard materials including industrial clays. Scanners pick up even the tiniest details in hair, clothing, skin. It is very easy nowadays for a person to create perfect statues without having ever even touched it in the whole process. Heather is passionate in her love of sculpting and her hands-on approach and not employing either companies or other people to sculpt her work. A video showing the beginning stages of Heather’s eagle monument. She is sculpting him from the ground up, by hand, without using any computer/scanning and CNC milling technology or assistants. She didn’t even start with a model or maquette, she went straight to monumental. 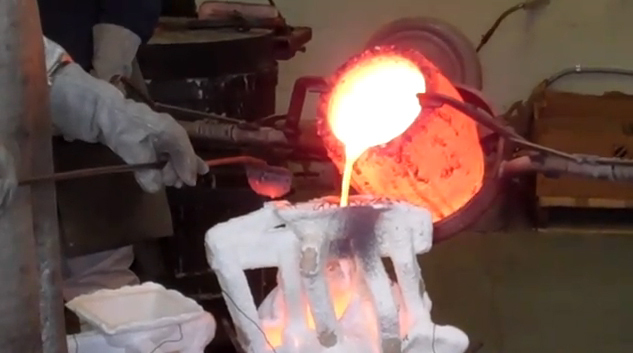 Sculptor Heather Söderberg-Greene enriches the area’s art scene with her bronze foundry. From the raucous First Friday gallery scene in Hood River to Maya Lin’s meditative Bird Blind in Troutdale, the Columbia River Gorge has blossomed into a bona fide arts destination. In 2009, sculptor Heather Söderberg-Greene opened a bronze foundry in Cascade Locks, where her iconic statue of Sacagawea now adorns the port. heathersoderberg.com. Q Is the gorge undergoing an art renaissance? A Definitely, in all media. Painting. Glassblowing. Pottery kilns. I get a lot of artists visiting my studio to meet other artists, which is exciting. Q Does the setting inform your art? A My hiking and explorations in the forest inspire and reenergize me. Watching bald eagles or the salmon run is amazing. I also love the mythology and history of the gorge. Q Best part of the creative process? A Sculpting a face. I don’t really control the expression—it just kind of happens. It’s almost like it’s alive. Q Can art lovers see you in action? A Yes, I love showing people what I do. They can watch me sculpt, talk to me, and take a foundry tour. A Lorang Fine Art in Cascade Locks—all local artists. Glassometry Studios shows amazing glass sculpture in Hood River, a town that also has the Columbia Center for the Arts and the Gorge White House, a colonial-style house with local art. A Infusion Gallery in Troutdale. It’s partnered with the Adult Learning Systems of Oregon. They have space dedicated to artists with developmental disabilities. Q Can visitors make their own art? A Definitely! I teach classes, and Glassometry does classes and workshops. I think that’s part of the excitement about art in the gorge—there are a lot of opportunities for people to come out here and create. An exciting night pour at the foundry! By Heather|2016-11-11T04:32:23+00:00December 1st, 2015|Videos|Comments Off on An exciting night pour at the foundry! A sculpture is static. Heather Soderberg-Greene is not. She’s on the “Lookout” for change after 20 years in making art from metal. 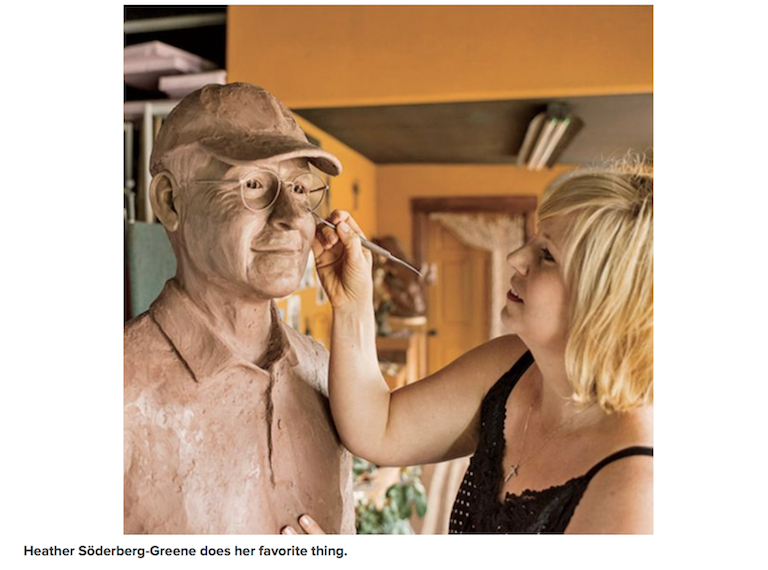 Four years ago, this sculptor came to the Gorge and quickly, and literally, made her mark in the community. We are open daily for visitors and sales. Please call to schedule a private tour or for any purchase or special commission inquiries.